This quilt is destined for my friendly Project Linus coordinator. Once bound, she is using it as a raffle quilt to hopefully generate revenue for our starving chapter. 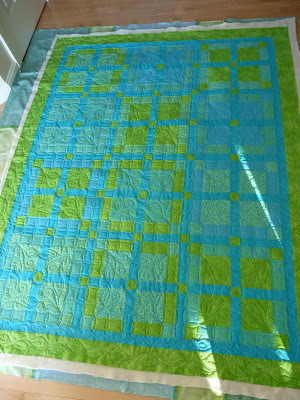 It took me (off & on) about a week to get it put together, amidst other quilting challenges and requirements. 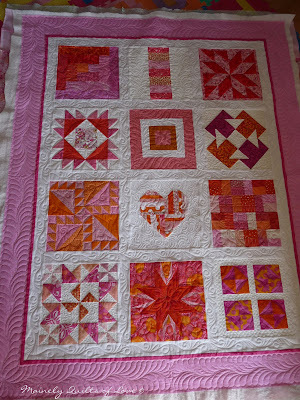 I had put together the orange & pink sampler shown a week or so ago, but I don't want to give that one on to her until summer/fall, as I plan to bring it by several quilt shops first. This was my first for using 2 layers of batting. I had only ever read about this technique. 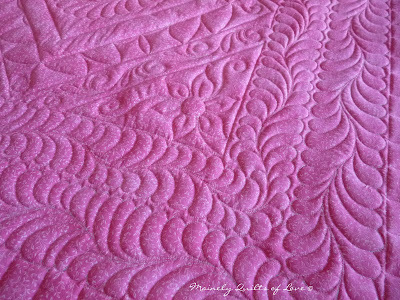 It gives the details of the quilting more definition, and makes this one whopping warm quilt too! I used a layer of Hobbs 80/20 of good weight and another cotton that was a bit thinner (and pieced from about 10 scrap pieces I had - testimonial of how thrifty I can be). I love how the feathering came out. I used three different colors of thread on the top - soft blue, white and lavendar. And yet a 4th (soft pink) on the back. Too many changes...Just too many. 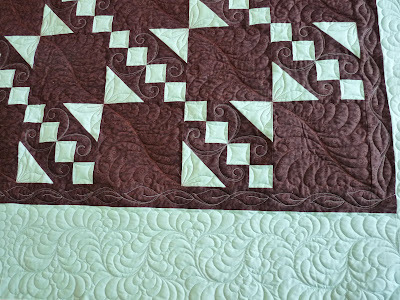 But it does enhance the look of the quilting to have them coordinating with the fabrics. ...and here is this corner from the back, just with a simple and puffy flower. It's really pretty with the rows of feathering and swirling sashing. 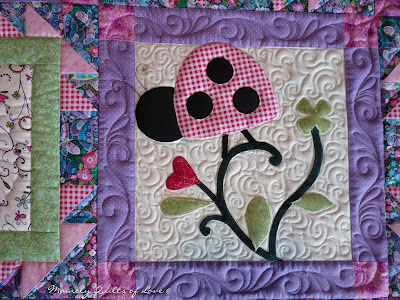 The center medallion has this kind of whimsical, kind of wonky ladybug. It's modeled after the ones in the other fabric, sitting on a big swirl, and a 4-leaf clover and a heart nearby. Sweet. Very sweet. 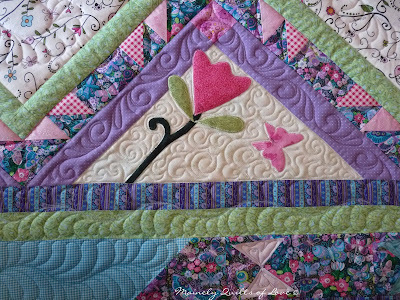 The green for the leaves is all a fairy frost, as are the pinks and purples of the "butterflies", the solid material that the appliques are on, and a pale pink used in the HST borders. The quilt has a great shimmer to it! I gotta admit, I really don't like machine applique one bit. These are fused and satin-stitch zig-zagged down, but mostly because I didn't have time to do it the "real" way (aka needle-turn). Ahh...the awesome texture and great colors. If I were a young girl, I'd be buying a ton of raffle tickets! I fussy-cut this flower from a dahlia fabric I had. It was just made for it! 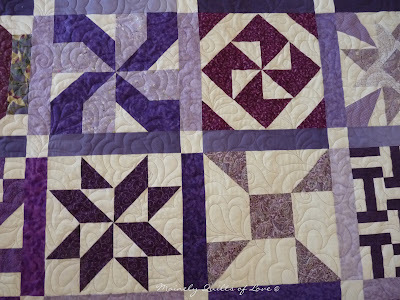 The purple sashing design is one that Carla Barrett showed us in her Quilt Whisperer class which I have been taking (although I secretly pirated it from her a week before she showed us!). LOVE it! This flower applique accidentally got fused in the wrong place (another reason why I hate fusible applique) SO I had to place a butterfly to balance the design. Looks like it belonged there all along. And a few fussy-cut circles to make the perfect flower petals. This was a fun paroject, and very creative. And since I don't do nearly as much piecing nowadays, it was nice from that perspective. The back is just lovely with texture. The last thing I have not showed you (as thouigh you haven't seen enough, I know, with 12 photos in this post...) are the 4 plain blocks. I always hesitate using plain blocks, especially when they are large as these are (9"). I really needed simplified piecing, that is why the only piecing detail is in the butterflies and the HST's. 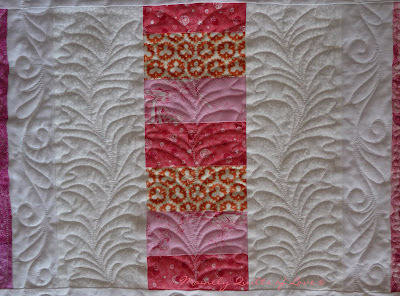 But these plain blocks have a great fabric, and I wanted a nice quilting to compliment it. I chose a feathered heart. They came out great with the double layer of batting. Nice & puffy. ...and the back of the hearts. So sweet. I kinda hope I win this back. I have 10 days to get it bound. Not sure what fabric I am using, but maybe a scrappy collection of pinks. Hope you liked seeing this! Maybe you have a quilt top you'd like me to quilt for you...just email if so. 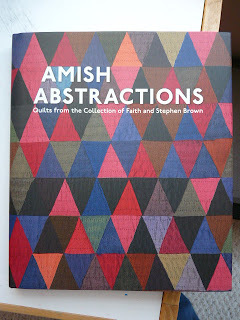 I received a copy of the book Amish Abstractions: Quilts from the Collection of Faith and Stephen Brown from the publisher and was asked to blog what I thought about it. I encourage you to visit their website and see where you can obtain a copy. It will envoke many interesting thoughts for you, as it did for me. 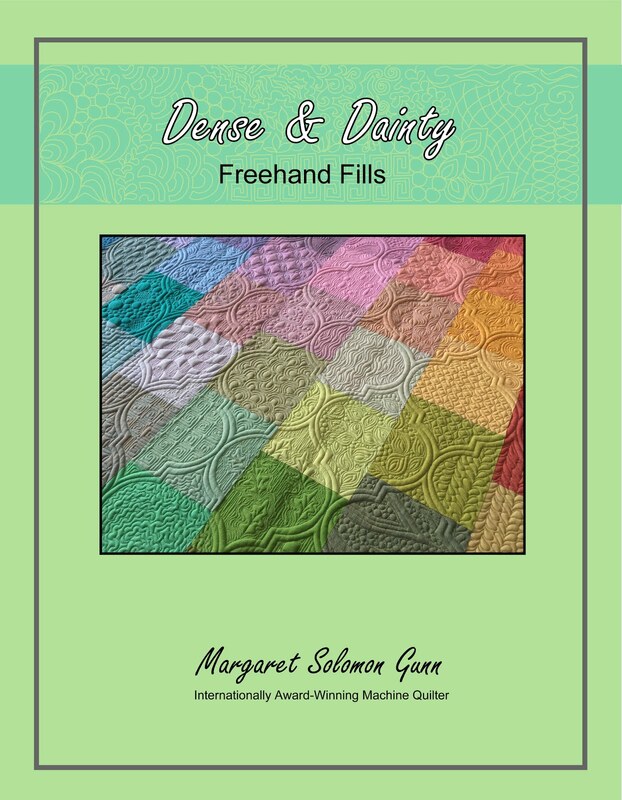 It is a slice of quilt history, and over eighty pages of wonderful Amish quilts. 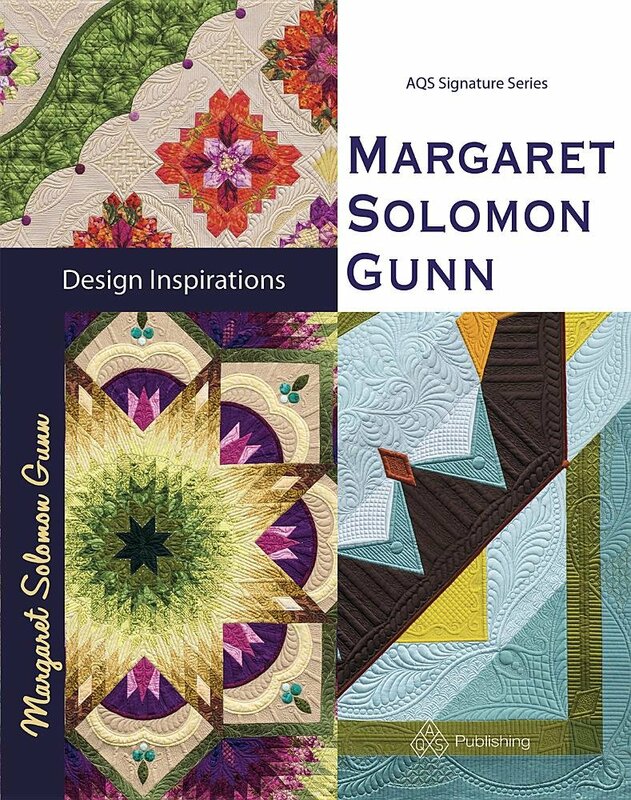 Many of my readers know that I love traditional quilts, especially those with historical roots. I favor simple, classic designs, even if I choose to execute them in a more modern fashion. 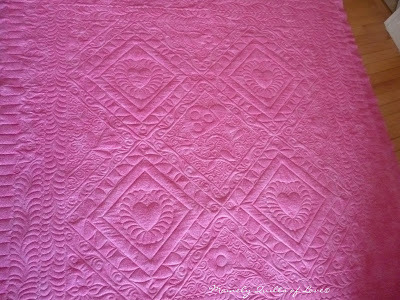 And despite being a longarm quilter, I still love hand quilting, enough to send my last large bed-quilt to an Amish outfit to be quilted. 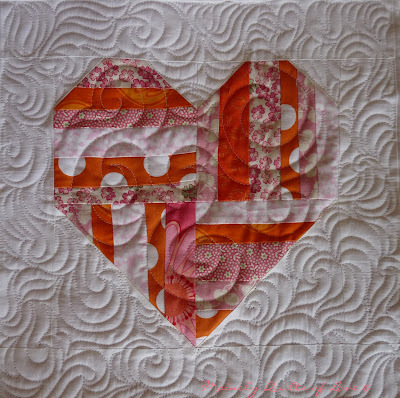 Hand quilting is an art being lost amongst newer and upcoming quilters, which is sad. 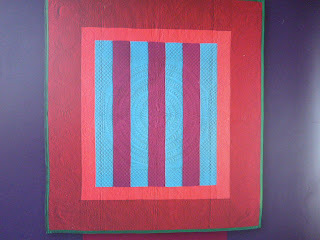 A few years ago, I made this wall hanging quilt. 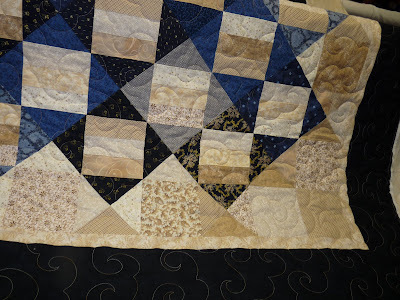 It was definitely not constructed of fabrics that I envisioned Amish women using, but then that was my perception at the time of what Amish quilting was. And I bet that my perception is much like your's. I figured they'd have used only duller solid fabrics, not wanting to flaunt brighter tones or tempt the viewer's eyes with bold color variations. I also thought that their designs were always simple, with minimal number of pieces, but yet hand quilted in a style they have come to be known for, as shown below. And I really thought that they were only for utilitarian purposes. These perceptions and more are forever changed after reading this book. I learned that some Amish only brought their quilts out to place on the end of their beds on Sunday or when company was expected. I appologise tremendously for the quality of these pictures. The publisher did send me a few files, but all seem to be corrupt and will not upload to Blogger. Did you know that the diamond-in-square pattern, which most of us immediately recognize as being Amish is really only a signature pattern from the Pennsylvania Amish? If you travel westward to the mid-western Amish settled in areas of Ohio and Indiana, you see a much more flamboyant style. It is believed that despite living in a sequestered community, they still adapted patterns and designs from the community at large. 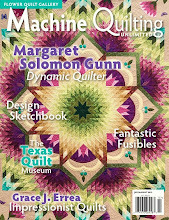 It's quite surprising for me to see crazy quilting, known for from the Victorian era, in Amish quilting. It is not intricately embellished and embroidered, but it is definitely a Victorian design. 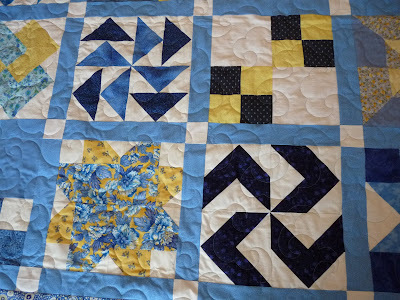 The Amish were believed to have made quilts from whatever fabric scraps they had leftover from making clothing. This all makes sense, but what does not is that many of the Pennsylvania AMish quilts have rather wide borders - wider than may be expected to be made from only scraps. It's pretty obvious that the children and babies were dressed in bolder colors than many of us believed! Though the fabrics are generally solid rather than print, there are definitely common uses of shades of purple, yellow, and pink amongst the Midwestern Amish. They also adapted more flambouant patterns like the Ocean Waves pattern with regularity. This pattern is pieced from MANY small triangles, and is also seen frequently amongst the Midwestern Amish. 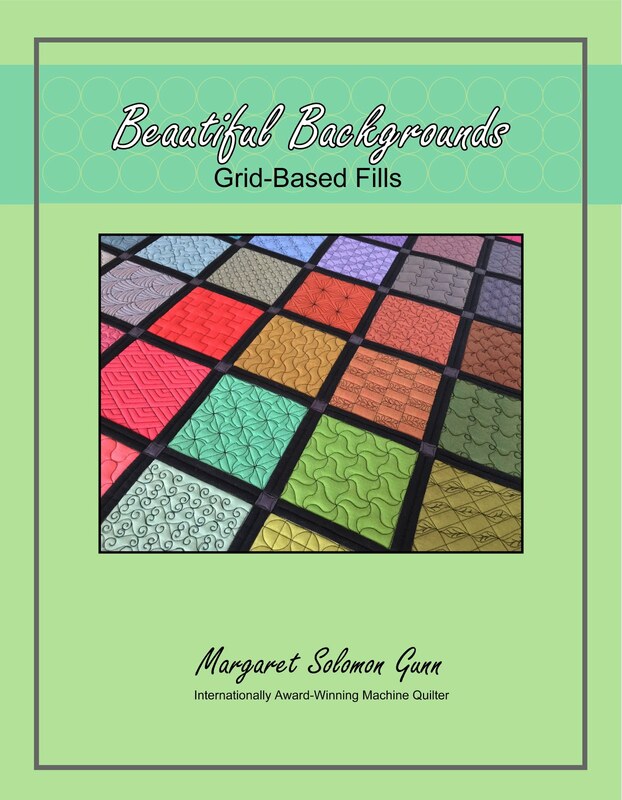 So regardless of your quilting inclinations, you will appreciate the story of the Amish quilting You will also love the many pages of gorgeous plates in this book - nearly 80. 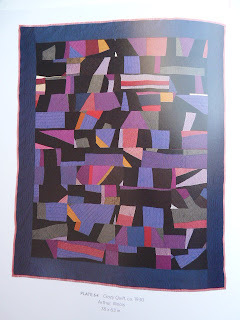 The Amish were without question fantastic quilters which helped to mold where quilting is today. I knew I was doing Bonnie's HGTV Challenge quilt back in December, but I found out a couple weeks ago that a woman local to me was also making one and wanted me to do the quilting. It's pretty bright. OK, it's blindingly fluorescent! But I do just love these colors together. Here's how it works. HGTV sends each participant a crayon of random color. You get to select one other fabric color to add to it, and it must match to a Crayola color. She was given the aqua, and chose to add the grass green to it. She initially wanted just an overall stipple since it is a donation quilt. But thankfully I talked her into something more creative. This is the continuous pattern I devised for her. 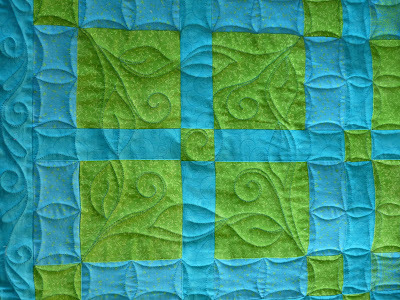 The fabrics hace swirls and leaves, so I copied these motifs to the quilting. My CC got better with practice. It was a little harder since the strips and the sashings were slightly different sizes. Overall, though, I think it worked ok. I love the two borders; kind of simple, but nice. And who doesn't like leaves and tendril swirls?? The owner was very pleased with it, and agreed it was SO much better than stippling. She even showed it to people at 3 different quilt shops that she visited that afternoon after picking it up. I always appreciate the free advertising. Can't beat that. Plus, she left me another quilt to do for her. As many of you know, I am furociously trying to practice feathers everywhere. And I mean EVERYWHERE. 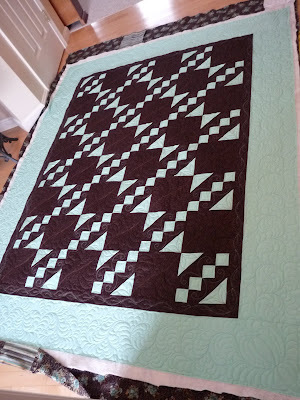 I chose to do much of the quilting monochromatically, brown on brown and green on green. 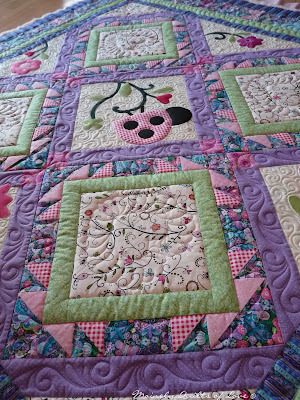 But I wanted a little bit of crossover to give the quilt a softer look. 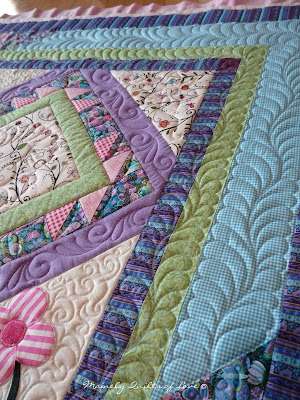 The whoppingly wide outer border is definitely done in green, to help hide my oopses with the feathers. In hindsight, they are pretty good. I love the look of the twirly-whirly feathering. It's the darn corner tear drops that are the hard part. Message to self...get some teardrop templates!!! The color crossover is shown below. 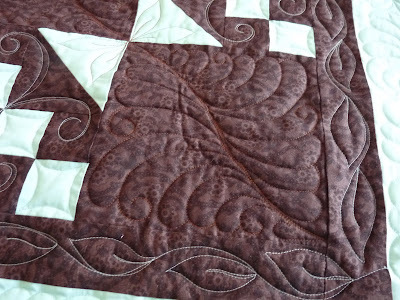 As I CC'd the diagonally running squares, I also did pairs of swirls in the green on the brown. 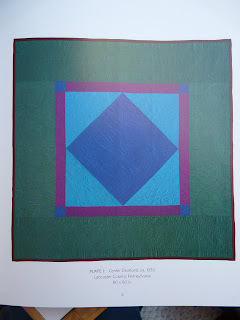 Similarly, as I feathered the 24 8" brown squares, I did a pair of leaves in the brown thread on the green fabric. There's also a row of vining leaves for the brown inner border. Though I may have done a fair bit of cursing about various issues with this quilt, I am happy with how it turned out and hope that the recipient is too. Be sure to look up the HGTV Crayola Challenge online and see how you can buy a raffle ticket too. You might win one of these quilts, and your proceeds will go to support the Ronald MacDonald House. 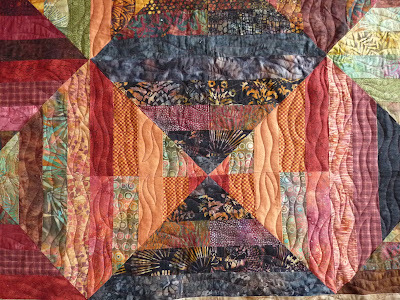 And a colorful quilt which I hope showcases many of my longarm quilting skills. As I mentioned a few days ago, a local shop needs/wants to see some of my work before they refer clients to me. 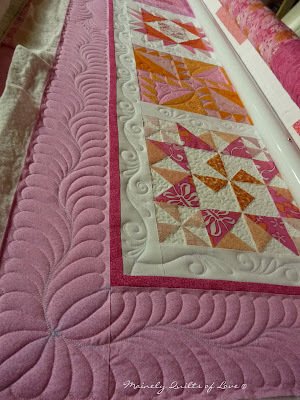 I didn't just want to bring them a quilt I did with a pantograph back in the first couple weeks that I had the machine. I wanted to bring them a home run. 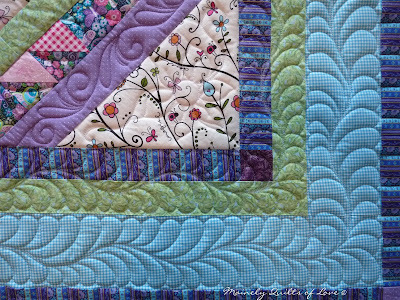 As far as what I have done to date, the quilting on this sampler quilt is out of the park. Even I am amazed! The blocks came from a swap (Quilt Block Exchange on flickr) - So I cannot take credit for ANY of the piecing except for adding sashings and borders. The ladies in this group did a fantastic job. There were even 4 blocks I did not use. I was going to make an altogether different quilt to take to the stores, and then donate it to Project Linus, but then I remembered that I had these blocks. It saved me a TON of work. It's still on machine here, with all of it's blue markings. The texture is just yummy! 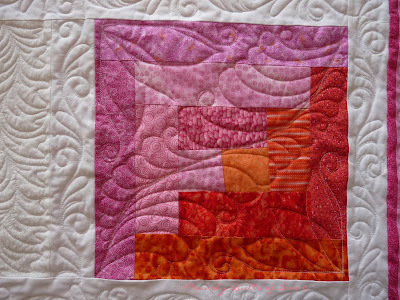 I specifically did every block differently to show some of the things I can both quilt and design. The back is pieced in 3 large pieces. Thanks to Joann's for not actually having enough of any 2 coordinating fabric! 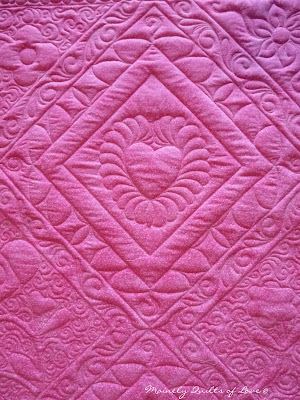 The quilting shows the best on this bright pink. 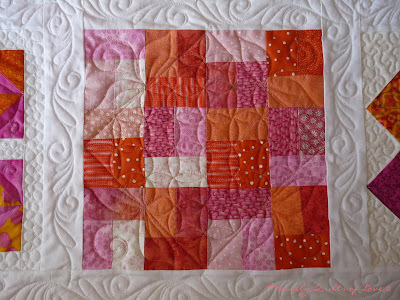 I wanted to give Mary's scrappy brick block some definition with the quilting. I always love that curved cross-hatching (whatever the heck is it's "real" name???) and wanted to toss it in on one block since I have plans for it on an upcoming quilt. I like how it is on point and the leaves and swirls help to ground it. This star was a little challenging. Mary did another fantastic job (she's a prolific block maker in this group), as she does with all her paper-pieced blocks. I think the flower and swirls did pretty well. Here's Alicia's HST's in a window frame, which I chose to pebble. I never imagined that the HST quilting might resemble little hangers! This block is cool in the back...be sure to scroll down a bit for a look. I've lost track of who made this coin block - sorry. With an abundance of white, I tried a leafy variation. And yet a 3rd block from Mary...I tried a feather variation with some swirls thrown in. It's much harder doing these along a diagonal! 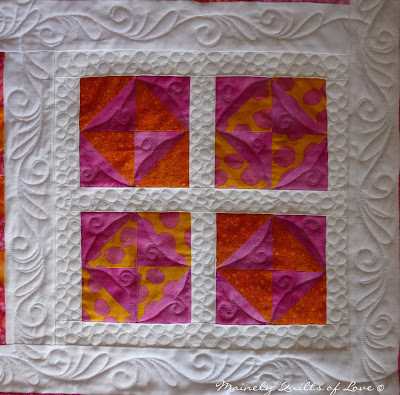 I love this block from Wendy, especially the flowery center. 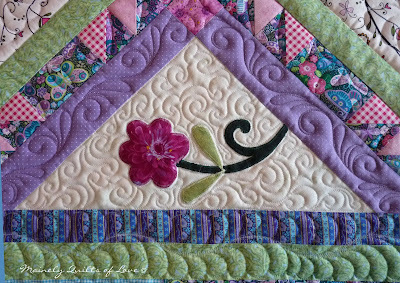 I wanted to keep the flowery feel with the quilting. A sampler wouldn't be complete without a little Mc Tavishing on Chelsea's heart block (or McMargaretting as I call it, so as not to bastardize what fabulous work Karen McTavish does!). Fun whirly-swirls fill the heart. 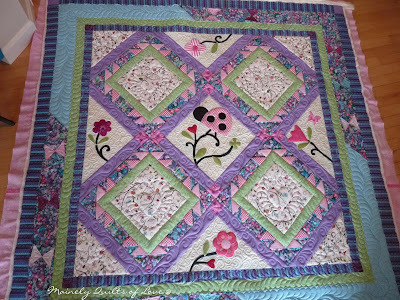 Another one from Alicia...FYI - I gathered pink and purple blocks in this swap for 2 or3 months last fall! And yet another "hanger" variation. I haven't shown close-ups of 3-4 of the blocks, but that might just be overkill. 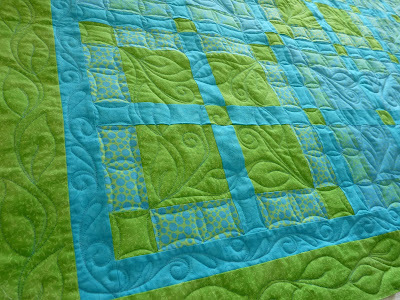 I assure you the blocks were wonderful and look awesome in this quilt. I suspect that this quilt will become something I am donating to my Project Linus coordinator to use as a raffle quilt to generate $$ for our chapter. I have not sewn anything for her since October, and am having a little bit of guilt. If I don't donate this, it will just become another one of my unpurchased Etsy Listings. I need to find a different place to retail the quilts I am trying to sell. It was a frigid 1F this morning. Today seems a bit late, but then rather appropriately cold day to show the table runner (17"x44") I made for my mother-in-law for Christmas. It was from a Moda pack of charm squares Lisa gave me last summer. I had originally wanted to do something for myself with them. I really love the butterflies and tulips, but it was crunch time in December and I really needed a Christmas present too. The quilting is overly simple, almost insultingly so. I should have done it on the longarm, but wanted to use the varaigated King Tut thread I had, and had never tried this on the longarm. Blah, blah, blah, long story, I opted to simply stipple it on the domestic machine. Only a good quilter would know what it could have been. Not sure if my feeble embroidery shows, but under the birdies (which my MIL loves to watch), it reads "Think Spring". 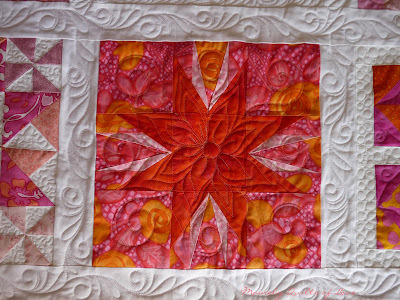 I have had a steady stream of quilts to finish up in late December and this month. I did this one, despite not having a good picture of it. The T-shirt quilts are challenging, kind of like quilting a slinky. Once you get it pinned to the leader, it just pulls back in. I wanted to scream ! Takes a bit of TLC to get to lay flat and square. On the plus side, I did not have to do anything complicated for the quilting so it did quilt reasonably fast. 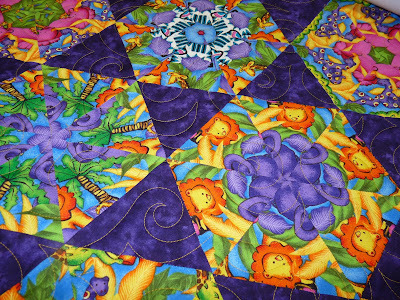 Here's a fun child's kaleidoscope quilt all in jungle animals. 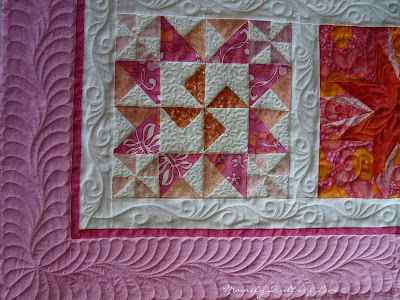 It quilted up cute with the gold thread and the swirls. 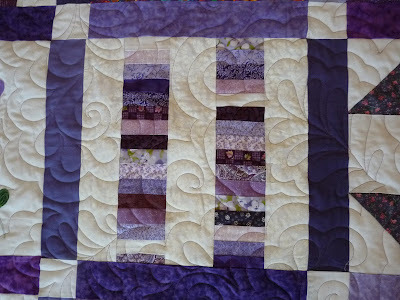 The backing is purple so the quilting shows nicely. And another quilt belonging to the lady who owns the brown stripes quilt...She requested this swirling cloud all-over pattern that I freehand. It is in a variagated rainbow thread. My week has been crazy. My class started Monday. It always takes a couple weeks to get the students engaged and really working, but my schedule has resumed. No more lazy holiday mornings. 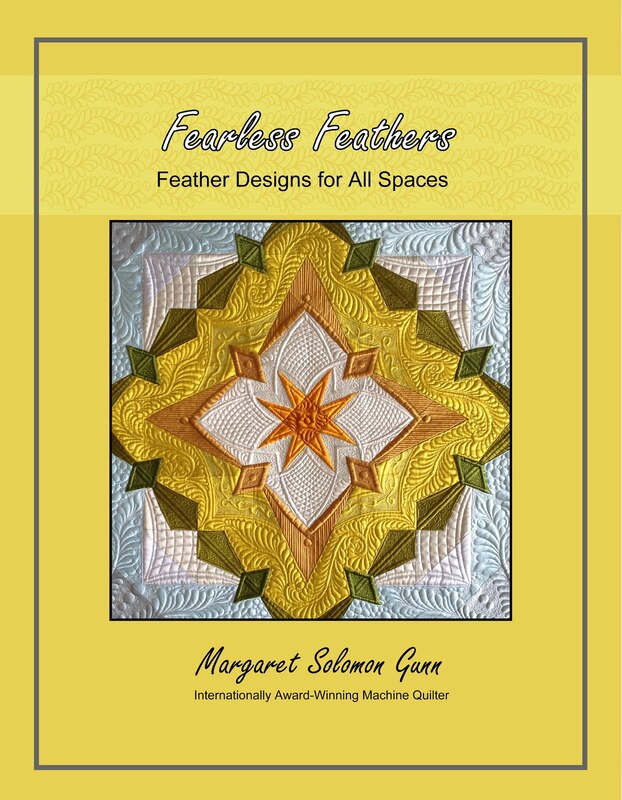 I started an online class running for the next 3 weeks "Quilt Wisperer" taught by Carla Barrett aka Feathered Fibers. It'll be humbling I am certain, but I hope to look at quilts and how I may quilt them differently. 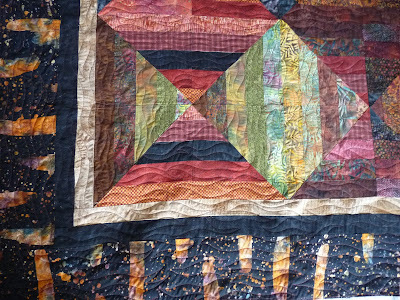 If you look at some of her quilts, you'll drool for sure though! I have also made up a sample of some things I can quilt for a local quilt shop. They won't refer me to clients until they see this. Nothing like buying and "wasting" 8 yards of fabric just to impress/show one person! OK, sarcasm aside, it was a pain to squeeze this into the current schedule, but it will come in handy to show clients what the many patterns can look like on ugly tan fabric. 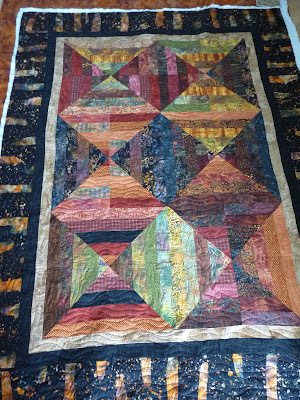 To better show what I am up to as a longarmer, I have also pieced some swap blocks into a top and have quilted away at this for the last 2 days. 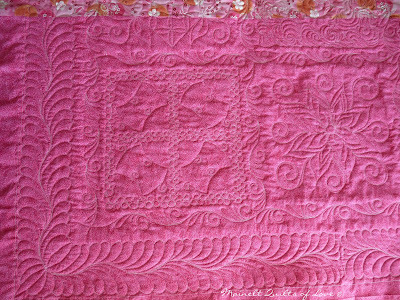 It has different quilting for each block, and pretty sashings and a feathery border. I will show this to the shop too (when it is off the frame!!). That is tomorrow's task: finish it. Then I have 2 Crayola Challenge quilts to quilt, one which I have, and one which is due to arrive Friday. Can you say "They both must be done by next week"??? Yikes! Time to run and do kid pick up, dinner, and all that other yucky stuff which fills my days. 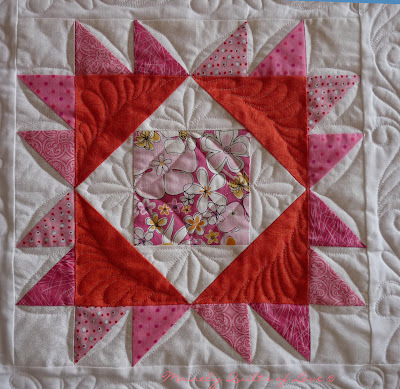 A person emailed and told me she needed to have a quilt quilted. She told me it was her first quilt and that I was to expect a ton of mistakes. I kind of hesitated, but figured that I could quilt it anyhow, unless it arrived with holes and enormous pillows of fabric. 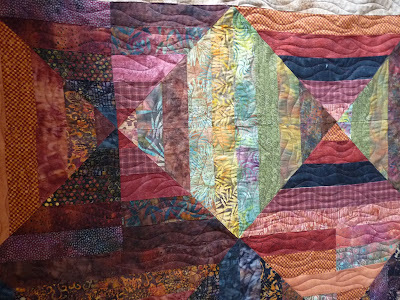 I pleasantly surprised to open the box and find a lap quilt made from the most succulent array of batiks. Though I sew with batiks rather infrequently, I totally love them. 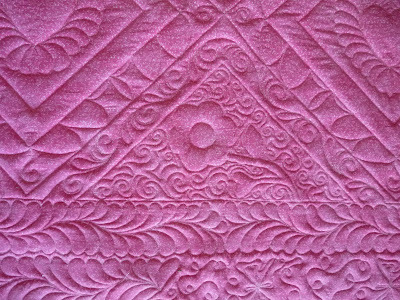 Despite the forewarning, I didn't find any gross problems with this quilt at all. Maybe there were pieces where she did not want them, but it was relatively square, and seams matched up nicely. 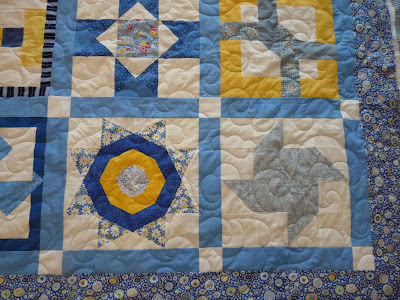 She has made this for a nephew so no loopy feminine quilting was requested. After seeing the fabrics, I chose a rusty-brown thread. In some places, it looks more red than brown, bringing out the red batiks which I think are so fabulous. 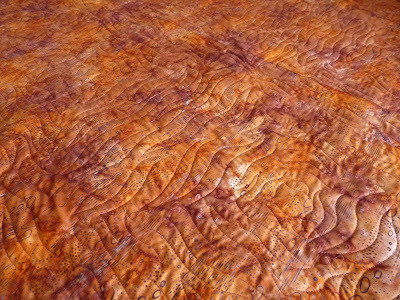 I decided to go with a simple wave-like or flame-like quilting which follows the logs of the piecing. That detail, however, is really only evident from the back of the quilt. As I have said before, sometimes nice surprises are on the back. 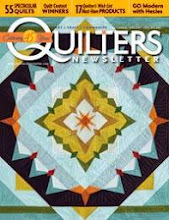 I admire new quilters...they have not been around enough to not try some things. Like, for example, I'll bet you didn't know that the black inner border of this quilt is of all things ultra-suede! It didn't press really well, and it caused my thread to break a handfull of time, but it has a nice textural effect. As a seasoned quilter of many eons, I'd never have tried the ultrasuede. Sometimes it pays to be a novice. I have a few orders of business to attend to this weekend and early next week. A local quilt shop wants to see some samples of my work. They called 2 days after I mailed off 2 nice and semi-custom quilts. After they see some quilting, they will refer clients to me. 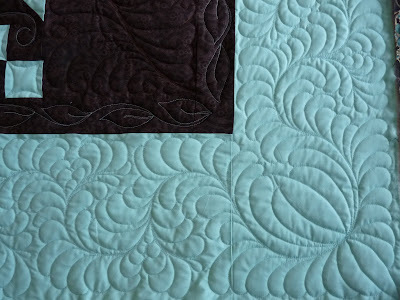 Right now, I only have a couple of pantograph quilts, and that is not really what I want to show. I went out today and bought some wide fabric that I will partition and quilt sections in different patterns, and then do some border varieties. 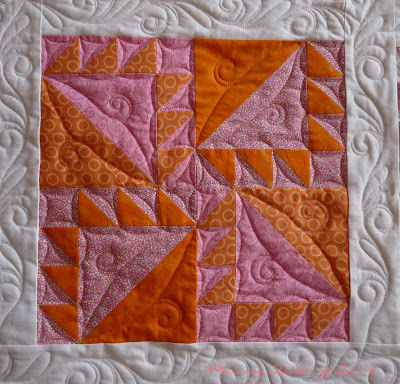 I also am frantically trying to complete a quilt top from some sampler swap blocks (orange and pink ones) so that I can custom quilt each block differently. THis may become a donated raffle quilt for Project Linus, or I may just sell it on Etsy. Don't know yet. Either way, I have a bit of work before Bonnie's quilt arrives mid-week! 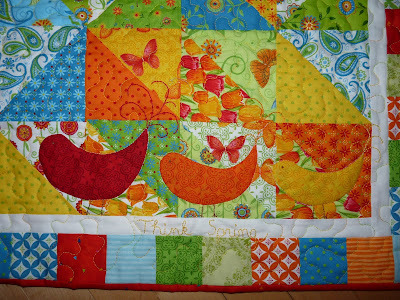 Before Christmas, I had the pleasure of quilting a couple more of Adrienne's quilts. She's already sent me two wonderful quilts, one of which was a fabulous sampler, and now she's sent two more. She must do many block swaps or bees to get such a fantastic variety of blocks. I took pictures of several just to give myself a nice reference of interesting 12" blocks. She only wanted an all-over quilting, so I didn't get to practice any super creative quilting, but I still think that the quilts came out pretty. 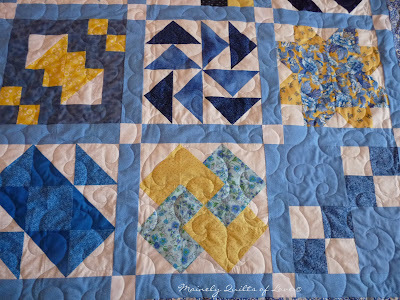 The blues and white reminded me of clouds in the sky on a sunny day, so that's what I decided to do - it is a swirly-cloudlike allover quilting. It is not very dense so it does have a fluffier appearance. 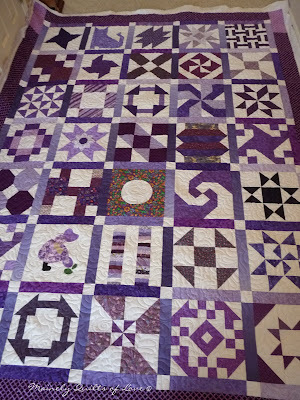 The second quilt is in one of my favorite colors - Purples!! It is quite large and has some interesting designs too. 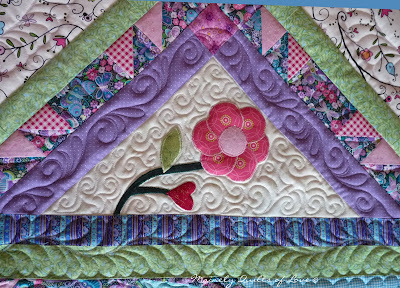 This is quilted in a medium lavendar thread and another all-over design that has loose feathery leaves, swirls and echo quilting. 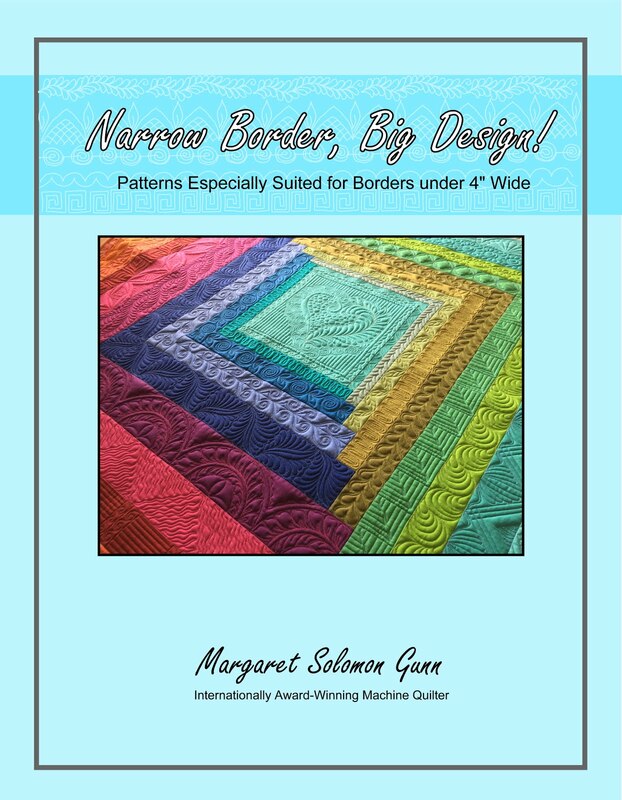 It is more dense than the blue quilt, and will definitely pucker nicely when washed. I wasn't sure if I'd like the look of the purple thread on the many white areas, but I stuck to my 1st instinct which was to match the thread to the sashings. I think that this was a good decision. And for the charitable among us, I must make mention of HGTV's Crayola Challenge. Quilts are being made in 2 pre-assigned crayola colors and are being raffled off in Feb. The proceeds (I believe) go to the Ronald MacDonald house. 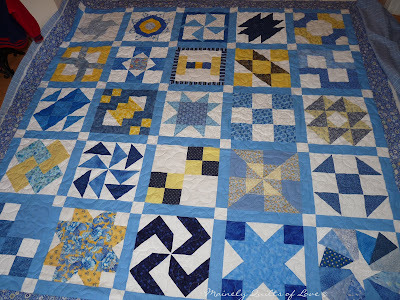 Anyhow, Bingo Bonnie is making one of these and I will be quilting it for her. I will post more about this in the coming weeks, but donating to this event is of interest to you, I urge you to follow it directly. Last year's quilts were fantastic. 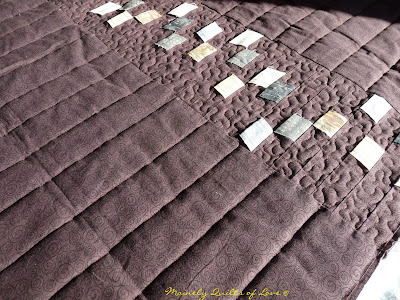 I only wish I had known about this in the summer to be making my own quilt!